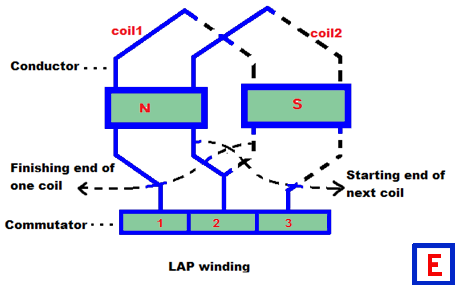 Let us discuss on Comparison Between Lap Winding and Wave Winding. 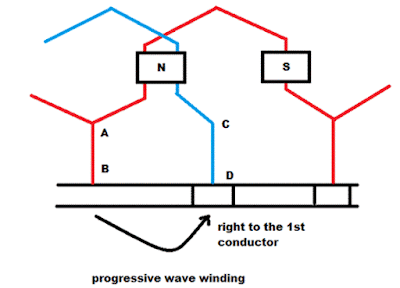 All the major differences between lap winding & wave winding provided here. direction are connected in other series circuit. 2. 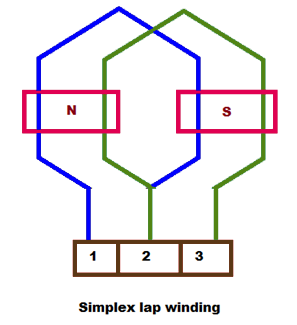 Lap winding is also known as parallel windings. 2. Wave winding is also known as series winding. is always equal to 2.
coils to provide the mechanical balance for the armature. 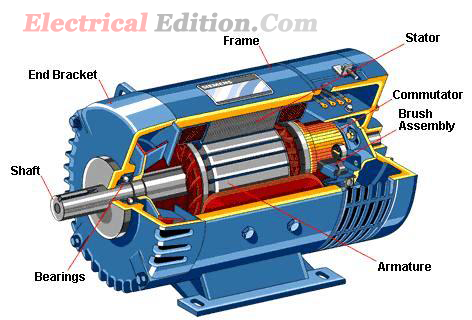 Why the Stator [Yoke] is Not Laminated in DC Machines? Usually laminations are provided to reduce the eddy current losses taking place in the magnetic materials used to provide path for the flux. 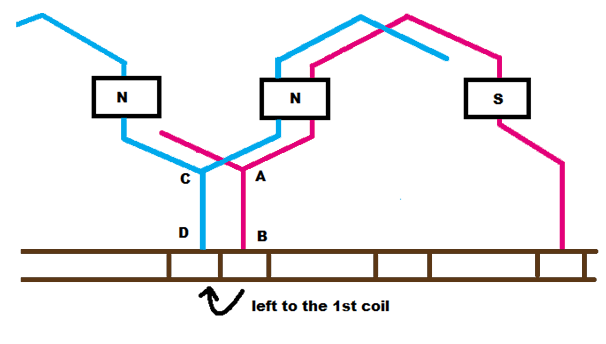 Whenever the flux linkages with the magnetic materials changes, e.m.f will be induced in the armature conductors. Apart from this, some e.m.f will also be induced in yoke and core of the machine. As there are closed paths in the yoke and core because of the induced e.m.f’s circulating current flow in them. These circulating currents are called eddy currents and the resultant I²R losses are called eddy current losses. Both the armature core and yoke are magnetic materials used to provide path for the flux and eddy current losses taking place in both of them. But, eddy current losses in yoke are comparatively less because the induced e.m.f’s in the yoke are comparatively less. because of less variations in the flux linkages with respect to time when compared to armature core i.e., dφ/dt is less in case of stator. Hence, the stator [yoke] is not laminated whereas the armature core is laminated. A Direct Current (DC) machine is an energy conversion device. It converts electrical energy to mechanical while working as a motor and mechanical energy to electrical energy while working as generator. Hence, it is known as electromechanical energy conversion device. It consists of stator and rotor. 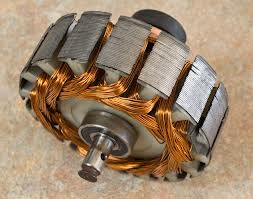 Stator is the assembly of main parts like yoke, main poles, pole shoe, inter pole windings etc., and the rotor is the assembly of armature, armature winding, commutator fan etc. Yoke is the outer cover of the machine supporting and protecting the internal parts. It is made of low reluctance ’ material like silicon steel or cast iron, Since, it has to carry the magnetic flux i.e., to provide the closed path for the flux produced through the poles. Pole core is generally a solid material and pole shoe is a laminated one in small machines, but the pole shoe and pole core both are laminated made of annealed steel in modern days. The purpose of the pole core is to provide flux and to support the field windings, Whereas the pole shoe is stretched so as to provide uniform air gap along the armature core and also to provide uniform flux distribution in the air gap. Brushes are the structures placed on the rotating commutator through which the unidirectional current is to be collected. Generally it is made of carbon, which can give smooth surface at the contacts so as to reduce the spark and wear and tear of the commutator bars. 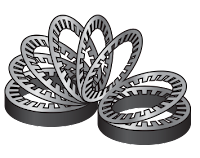 These are fixed to the stator core (yoke) by means of brush holders. The field windings are wound initially on a wooden former and then installed into the pole cOre. These are generally made of low resistivity materials like copper or aluminum. There are two ways of connecting the field winding to the armature in case of self-excited machine. 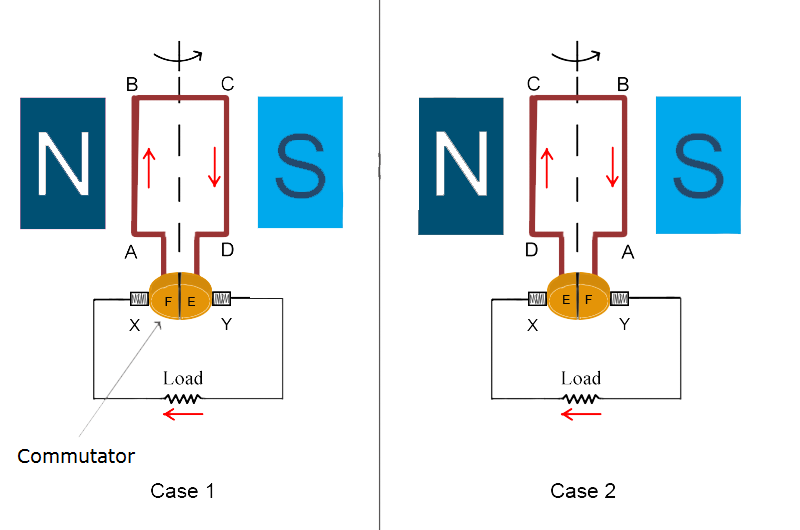 They can be connected in series or shunt. 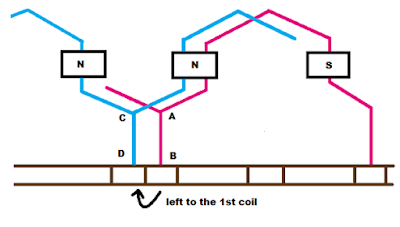 If it is connected in series less numbered turns with larger cross-sectional conductors are used. If it is connected in shunt, the winding would be of large turns, whose cross-section is less, so as to withstand for whole supply voltage. These are the pole structures generally smaller than main poles and is placed in between the main poles. 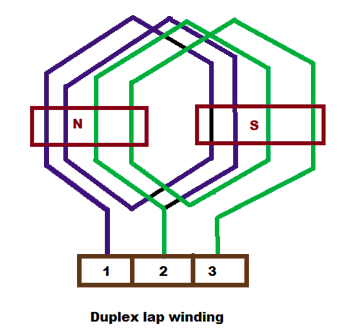 These windings of the inter poles are of less turns since it is connected in series with‘armature windings. The main purpose of these inter poles is to reduce the armature reaction, thereby reducing the sparks at the brush contacts. The polarity of the inter pole is made same as that of the main pole ahead of it in the direction of rotation. The rotor is generally rotating part which carries the armature, armature windings and the commutator on the same shaft. The armature core is made of laminated silicon steel. The main purpose is to hold the armature windings and to provide the low reluctance path for the flux. 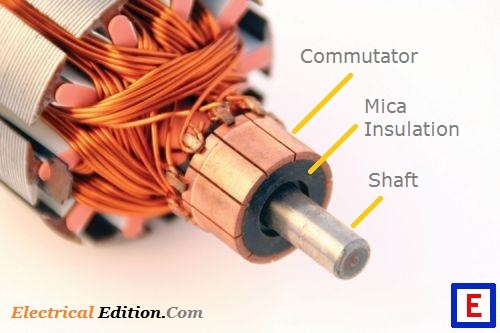 The commutator helps in converting this alternating emf into direct current emf. This is, therefore, also known as mechanical converter. Lap windings are preferred for higher currents and low voltage and wave windings are preferred for higher voltages and lower currents.